Tomahawk Vineyard is a small group of vines that is the pinnacle of Chimney Rock estate in Stags Leap District. Planted in 2002, this vineyard has stunned everyone from the very beginning with its intense, massively complex fruit. Compelling, multi-layered and elegant, this wine always displays the signature lush mid-palate and lengthy finish that is the hallmark of Chimney Rock. Tomahawk Vineyard is a tribute to the resilient native Wappo Indians that once inhabited the Napa Valley, and helped give Stags Leap District its distinctive name. At Chimney Rock, we celebrate the singularity of this vineyard, spending significant time and resources nurturing the vines to grow the most beautiful fruit possible. The 2015 Tomahawk Vineyard Cabernet Sauvignon is produced in very limited quantities and it celebrates the ultimate expression of Cabernet Sauvignon. My experience as a winemaker began with two wonderful internships, the first at Trefethen Vineyards and the second at Chimney Rock Winery, more than a decade ago. I then went on to Napa Wine Company for a few years as lab director and assistant winemaker, where I learned much from some amazing winemakers in this valley. I was fortunate enough to work closely with Heidi Barret, Celia Macyzek, Erin Green and Pam Starr, among many other inspiring women in wine. I then returned to Chimney Rock as assistant winemaker in 2002 and was eventually promoted to winemaker. 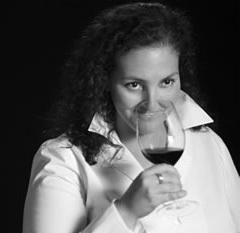 My goal is to create wines with great texture and to have those wines represent the vineyards from which they are born. The tactile experience is just as important as the aroma and flavor. More specifically, my goal as winemaker at Chimney Rock is to highlight and honor the strengths of the amazing Cabernet we grow in Stags Leap District.